… It’s always about the WHY. In life we get caught up in the daily drama of WHAT is happening to us – “Who did what to us? Who said what to us, etc…”. We get sucked into the drama and it’s subsequent villains and tragedies. We make “what is happening to us” our story, when in reality it’s NOT our story at all. To truly understand your story, you must learn to look past “WHAT is happening to you” and look at “WHY it is happening to you.” Inherent in every “what” is always a “why”. In other words, what life lesson is showing up in your life right now and what does it have to teach you? 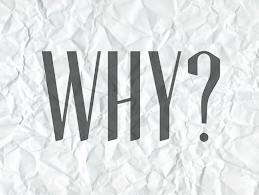 Don’t shoot the messenger, the “what” is just the delivery system for the “why.” Every time we fail to get the “why” another “what” shows up to give us yet another chance to figure it out. So don’t get hung up on all the “whats”, looked past them to find the pattern of “why”. Once you get the lesson, it stops and life becomes happier and easier. Are you ready to see your life more clearly? When you learn to ask “why”, the “whats” no longer have any control over you. It is only then that you find more meaning in your life then ever before. What are you waiting for?